When it came to his SS19 collection, Vasilis Loizides had Cyprus in mind. Having grown up on the Mediterranean island before heading to New York to enrol on Parsons’ prestigious fashion course, the designer has long felt drawn to his homeland’s storied, and truly ancient, history – and more particularly, its gods, monsters, and wild myths and legends. Thankfully, the beautiful but ultimately tragic tale is not one Loizides can relate to. Since graduating in 2017, the designer has been making a name for himself with his imaginative and wildly beautiful genderless collections made up of softly draped tailoring, knotted satin tunics which swathe around the body, and corsets finished with enormous, ballooning sleeves. They’re also often very personal, with SS19 embellished with prehistoric Cypriot artefacts, picture postcards, and huge, billowing poppies – “the symbol of eternal sleep back home”. 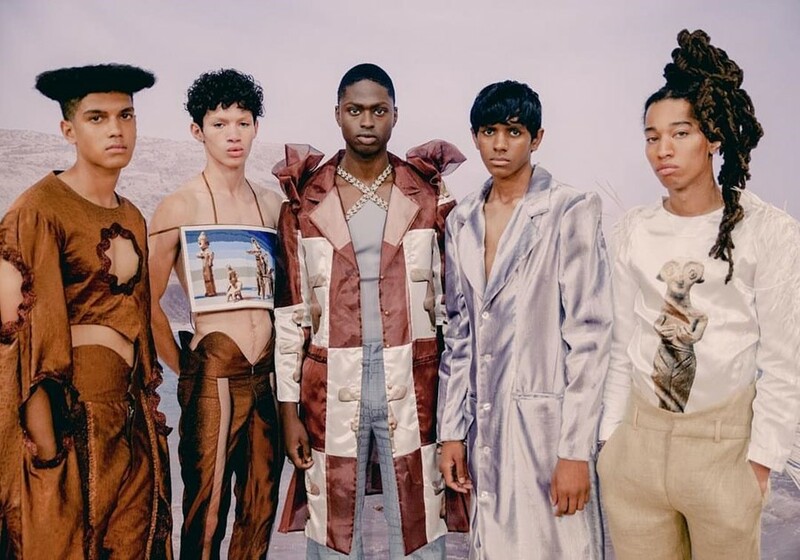 With his clothing giving off the feeling they could themselves be future artefacts, it’s perhaps not surprising that he’s garnered a significant following in a pretty short time: with the likes of Dev Hynes, Yves Tumor, and reigning Drag Race queen Aquaria among those wearing his pieces. Now, the designer releases his first ever film, Alma – a quiet, sweetly intimate snapshot of a day in the life of Alma, a trans woman living in New York who Loizides met through friends. “I was really inspired by Belgian director Chantal Akerman’s film Jeanne Dielman, 23 Commerce Quay, 1080 Brussels, which basically just follows Dielman as she goes about her mundane daily business,” he says of the short, which was directed by Deni Cheng. Wearing a series of Vasilis Loizides looks, Alma prepares a meal, enjoys a glass of Chardonnay, talks to a friend on the phone, and heads out on a blustery walk to the river, while simultaneously discussing her emotions, her desire to hire a car and drive until the gas runs out, and modern mediocrity – before finally asking the question we’ve all raised at some point: ‘Is this it?’.